With the recent introduction of the New "iPad Air", I have been looking forward to getting back to a large screen, since I have been using an iPad mini for the last year. It is my first iPad with a retina display as well. First impressions was, in a word, "Light". 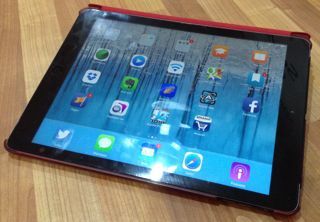 It truly is very light and noticeably close to the mini compared to the iPad 2 that is, but this is not going to be just another iPad review, I am here to tell you about how I use the iPad and how it helps me in my day to day life. My iPad, iPad Air Black 128Gb Wifi + Cellular. Unlike most, my favourite apps are not on my home screen, I keep the standard apple apps there. So... moving on from the home screen, to the dock, I keep a total of five apps here and they will normally not change, in fact until recently I only had four apps in the dock. What are they, nothing special, Twitter, Messages, Mail, Safari and Podcasts. There you have it these five apps are the most heavily used on the iPad, with the Podcasts app racking in at number one. I want to take a little time to go over this area as I feel it needs some attention, until about 1 year ago I had not really listened to a podcast on a regular basis, it took me finding the Mac Power Users podcast to really whet my appetite to get me going. Now I listen to about 3 to 5 hours of podcasts every day, with "Out of School" hitting top of the list. This podcast has really influenced my direction and has opened my eyes to the potential of the iPad not only in education but also in day to day life. Since I have been listening to Out of School, I have been creating a training course aimed at all ages from 5 to (any) to teach people how to use a Mac and not only just use a Mac but to also expand their thinking in the same way Out of School has for me. Pages, used to plan and create new training courses. Keynote, used to expand what the training courses can offer directly from the iTunesU app. Dropbox, cannot over state what I life saver this app is, used for everything from normal file storage to sharing on projects and general publishing. Evernote, not used this much yet, not found the need, but like most I have kept it, incase I can use it in a workflow one day. Atomic Web, this is a very powerful app and can do wonders, from secure browsing to the real reason I use it, that being the "identify as" feature, where you can specify what type device you are using. Allthings, this is a general todo list with expanded features including collaboration and commenting within task, this can be very useful on a team which on the go and need to quick brain storm an idea without creating a new task. So I want to create a new course and I’m out and about, which is very common situation to find myself in, I like coffee so when an idea comes to mind, it tends to be when I’m drinking one. My first course was designed fully on the iPad, "New to Mac" was created with the following, I first wrote the course outline needed for the iTunesU app in pages, this allows for my course outline to be expanded upon without the need to return to the Mac to edit it on the iTunesU portal, as you may be aware iTunesU portal is not compatible with Safari on iOS. Once I have the basics of a course outline I can now start to build some content. Keynote coms in very useful and with a few slides created with the major information presented the course was starting to take shape, A video created in iMovie to help show off some PR videos from apple. iPhoto makes the quick editing of images simple and very effective. Once all these elements have been started, I can simply continue where I have left of without worrying about saving the item due to the power of iCloud. Once I do return to the iMac, I create a new folder structure in dropbox and start to compile a list of documents, images, video and references which are then available on the iPad via the dropbox app. The course can really start to expand now, but before I go to far it is always best to see what you have got so far, so back to the iMac, launch safari and login to the iTunesU portal. Next I simple copy and paste the course outline, add posts, assignments and materials. Once my offline progress has been fully uploaded and updated, I can view the result in the iTunesU app of the iPad. This approach of not trying to do it all at once, not finishing the idea before it started allows a fuller experience. This can lead if you are not careful to not ever finishing anything, knowing when to stand back and say, done, can only be achieved with knowing what your goals are and ensuring you review them and don't forget them. To some up, just like I do with a project, look back at the goals. My goal was to explain how I use my iPad to "Get things Done". Apples iWorks and iLife suite are key to achieving my aims and allow my ideas to quickly turn from lightbulb to structure and content. The Apps I use are not expensive and complicated, I mostly use what is already available to everyone, Apple's own apps. The success of my workflows are down to the tools available to me and I'm always looking for new ways to make them more efficient and above all simple.